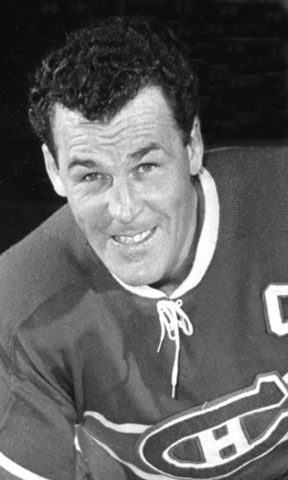 “Butch” Bouchard was voted into the NHL Hockey Hall of Fame in 1966. In 1940 with Providence, this stalwart defender scored 3 goals and an assist in 12 games. A captain of the Montreal Canadiens for 8 years and a 4-time All Star, he was a major contributor and one of the greats of the game, starring on four Stanley Cup championship teams with his hometown team, capturing the trophy in 1943, 1945, 1952 and 1955. He was known as one of the most feared and best body-checkers of his era. Ironically, during the 1946–47 season, Bouchard became involved in a prolonged and one-sided fight with another Reds’ Hall of Famer, Boston's Terry Reardon. Due to the fight, Clarence Campbell, president of the NHL, added the responsibility of breaking up fights to the duties of referee for the first time. Over his 15-year NHL career, from 1941 to 1956, he scored 49 goals and 144 assists 193 points with 863 PIM in 785 games.